Minehead Station was first opened in 1874 when the Railway was extended to the town from Watchet. Part of the original station building exists along with the Goods Shed (which is now part the Locomotive Shed). The station is the headquarters of the present Railway Company. All main departments are based here - Operating, Mechanical and Civil Engineering, Signal & Telegraph and Administration. The station has been extended at least twice over the years. The former parcels office now houses the retail outlet "Buffer Stop Shop". 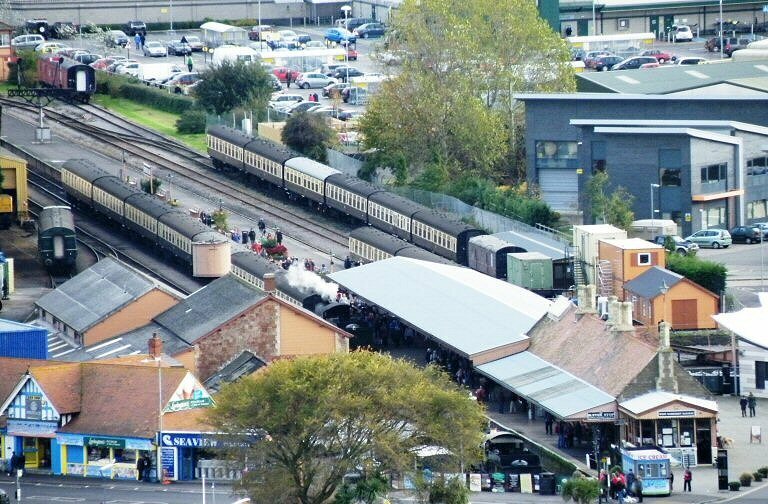 The platforms are probably the longest on any heritage railway and the main platform can accommodate a sixteen coach train plus a locomotive, with the bay platform not far behind with space for a twelve coach train. The main steam locomotive shed is at Minehead along with the carriage and wagon works. The turntable - a much needed facility - was installed in 2008. Minehead Station is cared for by the Friends of Minehead Station.